Nearly two years ago my good friend Gina gave me her starter Singer sewing machine when she upgraded to a more uber model. (By the way, her blog banner is out of date. She now has six cats.) Armed with Lotta Jansdotter’s Lotta Jansdotter’s Simple Sewing: Patterns and How-To for 24 Fresh and Easy Projects, I chose a tote bag for my first project. I got about three-fourths of the way through it when I got stuck. The sewing machine wouldn’t do what it was supposed to, the bobbin thingy was misbehaving, and I got annoyed. So I put away the machine. For a long time. I brought it out of storage again last month, determined to figure out this sewing thing once and for all. 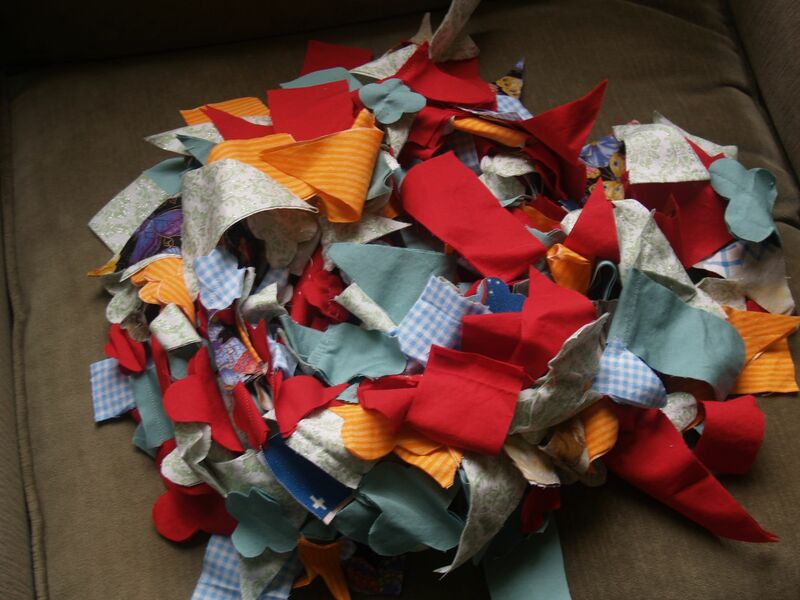 I had lots of ideas for Sylvia’s birthday, and many of them required sewing. For some reason (maybe the stars were properly aligned this time? ), the machine worked just fine this go-around. I finished up the tote bag (yes, it’s a little lopsided, but since it’s the first thing I ever sewed on a machine I think it’s not bad) and got to work on the birthday-related items. First up: a fabric garland. As soon as I saw this party garland a few months ago at the Purl Bee, I knew I wanted to make it. I ended up using various bits and bobs of fabric I had lying around, as well as some interesting cottons I found in the remnant bin at Joann. My garland isn’t as “pretty” as the Purl Bee’s, true. But then again, mine isn’t made out of pricey designer fabrics. Plus, I wanted to keep the color as non-seasonal and non-gendered—yet still very festive!—as possible, because I figured this would take a lot of work to put together, so the result had better be useful for lots of different occasions. And yes, it did take a long time to make this. That time was spread out over many evenings, though—a little here, a little there. Ten minutes before the official start time of Sylvia’s party, it was pretty clear that the rain was going to make us move the festivities indoors (eight kids and eighteen grownups! ), Jan and his brother set about stringing up the garland inside. All told, it was over sixty feet long—enough to zigzag across the kitchen, dance across the dining room and living room ceilings, and crawl up the bannister a bit. Keep it up! I just got a new singer (my old one I got for free and it was probably from the late sixties early seventies)…I am totally loving it and I love Lotta’s book — I am a pro at making yoga bags! ;) My friend and I are now working on the bedside pockets. Arianna and I have something (sewn) to send you — the sewing isn’t perfect, but I love the handmade nature and the utility of it — and the fun Arianna and I had making it together! (Ok, Arianna cut and I sewed and sewed and sewed so much Arianna and I joked I was like her sweatshop worker. Anyhow, not to ruin the surprise, but it just seemed relevant to remind you not to get frustrated. The garland is awesome, by the way. Wow, I don’t usually write so much! @Bethany: Thanks! I just got a new yoga mat (it is larger than the standard ones) and am wondering how easy it is to tweak Lotta’s yoga bag pattern. Have you done that? Great sewing, Marsha! I just busted out the sewing machine that is being lent to me by my bf’s mother. It’s a heavy, old machine that I love but cannot find any instruction manuals for, so not so plug-n-play as I’d like. But I am hoping my rudimentary sewing skills on my mom’s old Singer will help me figure things out as I go. Would love to see a post about your bag, and your opinion of LJ’s book! @JD: I really like LJ’s book, even though I’ve made only one project in it so far. It’s very well written, and the instructions are clear (and encouraging!). I’m hoping to start a new project soon. Oh, and as far as instruction manuals go, have you looked online? There are lots of scanned (PDF) manuals available for free, either through Singer or another site. Try looking up the model number. Good luck! Love this. 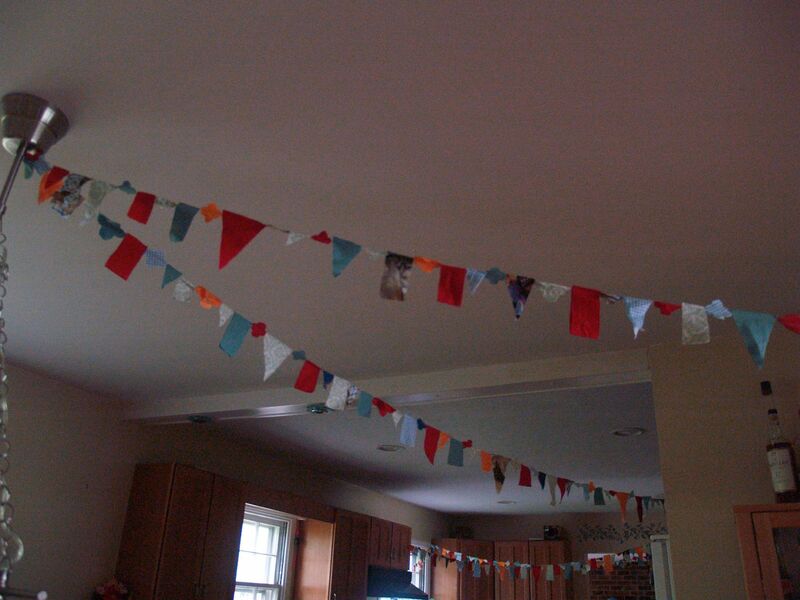 I made 2 garlands … both all triangles … one said happy birthday on one side and Katie’s Room on the other side. The other just said Talia! I really enjoyed making them. But the larger one showed my how lame my machine was. An old Brother from the 1980s … bottom of the barrel model starter machine. But I managed to get a(n equally as old) Singer Merritt from Freecycle. Still old, but it has the power I need.